Fu chanpuru is basically fried mix vegetables, but ingredients such as goya and fu make these dishes unique to Okinawa. There are many ways to cook chanpuru and you can simply use vegetables that you can find in your fridge. In this recipe, I am using sesame oil to make this fu chanpuru a little bit special. You can use normal vegetable oil but sesame oil will make your fu-chanpuru much more fragrant and encourage your appetite. 1. Place the pork in a bowl and mix with cooking sake. 2. Soak the fu in the water to re-hydrate and leave until it absorbs the water and becomes soft. Then take it out from the water and squeeze out the water and tear the fu into pieces. 3. Break the eggs into a bowl and lightly beat them. Add the fu and a pinch of salt into the bowl and mix with the eggs. 4. Heat 1 tablespoon sesame oil on a skillet and cook the fu and eggs. Once this is done, take the contents out of the skillet and leave it in a bowl. 5. Put 1 tablespoon sesame oil into the same skillet you cooked the fu and eggs. Then heat through the pork at a medium heat. 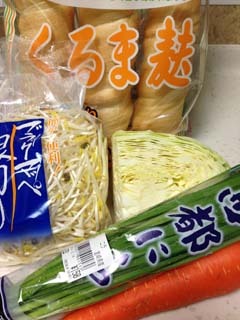 Then add the cabbage, carrot and Chinese chives. 6. 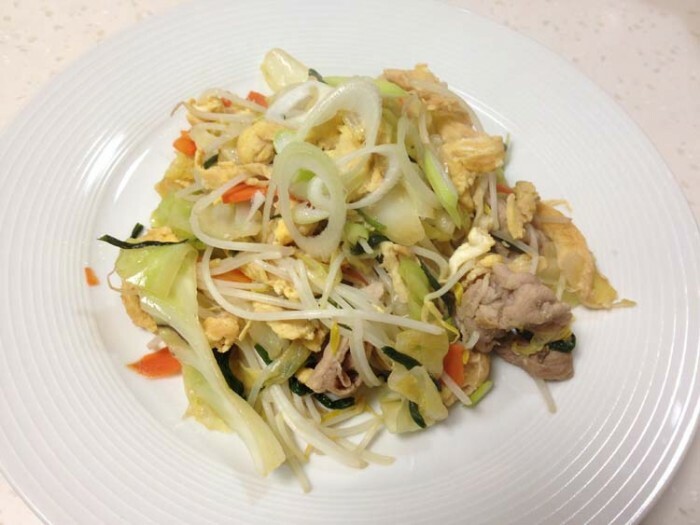 When the vegetables start to become soft, add the fu /eggs, soy sauce, mirin and salt, and mix well. 7. Bean sprouts are quick to cook and are nice and crunchy when they’re not over-cooked. So add the bean sprouts and cook for one minute or two, if you like to keep the crunchiness, but cook longer if you would like to heat them through. 8. Dish up and garnish with Japanese leek.